CD review: "Years Since Yesterday"
This review first appeared in the September 9, 1988 issue of the San Diego Evening Tribune. This second outing by San Diego's Paladins should establish them nationally as credible practitioners of blues-based roadhouse rock. 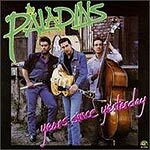 Combining spirit and energy with country, blues, rock and folk, the Paladins are mining a uniquely American form of music made popular by artists such as George Thorogood and Stevie Ray Vaughan. The songs on "Years Since Yesterday" range from swinging rockabilly to a stricter blues. While the trio seems comfortable in the entire spectrum presented here, they exhibit more enthusiasm and love for the music than raw ability. Singer/guitarist Dave Gonzales shows some tight fret work on a rambunctious country-rocker titled "Going Down to Big Mary's." The way he slowly picks through the passage is like watching someone make their way across a river on moss-covered rocks  it's darn exciting and makes you glad you're a spectator. But when listening to the album as a whole it becomes apparent that what this band needs is a lead singer who can stand musically side by side with Gonzales' guitar playing. The band's instrumental versatility is unquestioned, ranging as it does from blues tunes like "Happy Home," "Your New Love" and the title track, through rockabilly songs like "Right Track" and "Don't Stay Out All Night." The rhythm section of drummer Scott Campbell and bassist Thomas Yearsley provides a fine complement to Gonzales' lead guitar work, but Yearsley is no better than Gonazales as a singer. Frankly, the untamed vocals detract from the album. Still, the pluses of "Years Since Yesterday" more than outweigh the drawbacks. The music pulsates with vivacity and life, and the production is as clean and clear as Alligator's reputation promises.